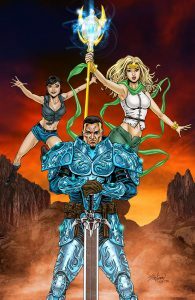 Many thanks to Excalibur author Cody Martin for allowing us to use this new, dramatic image to promote his fantasy novel “Adventure Hunters: Similitude”! 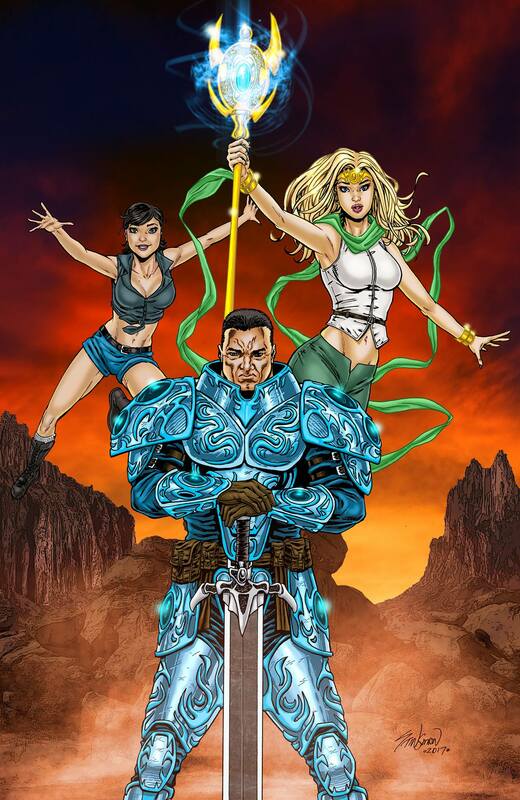 This illustration is by John Stinsman, an artist who worked with Rob Liefeld on Image and Awesome comic titles, including Avengelyne and Lady Pendragon. You can find a gallery of his work here! Artorius, Regina, and Lisa are three adventurers who explore ruins and ancient buildings looking for treasures. Most of the time, they’re just trying to make ends meet … but when they explore a town ravaged by goblins, they get more than they bargained for. They uncover a cache of ancient war golems, powerful weapons of destruction previously thought to be myths. Soon, they are in a quest for the Lambda Driver, the key to the golems’ activation. They aren’t the only ones, however, and they will have to defy their own king to find it first. If King Ryvas has his way, he will unleash the golems’ destructive power on the neighboring kingdom. The adventurers’ quest will take them from mountains to poisoned valleys and enchanted forests, but time is running out … Where is the Lambda Driver? What secret do the golems hold? And does their friend Regina know more about the golems than she is saying? “Adventure Hunters: Similitude” can be found here!